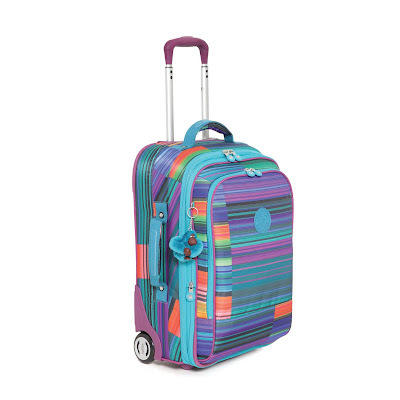 Great news for travelers who want style and convenience for their summer travels! 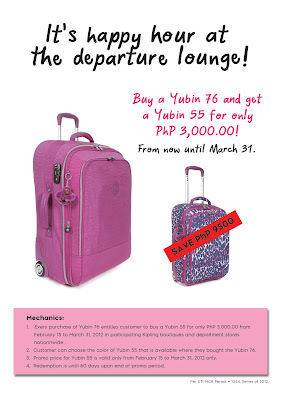 Get a chic Kipling Yubin 55 cabin-size luggage at 75% off when you buy a Kipling Yubin 76 extra large expandable trolley bag from now until March 31, 2012. 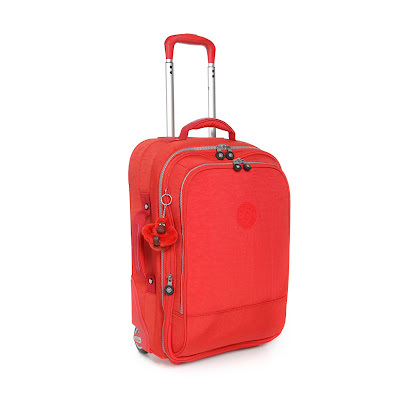 Whether you’re a light or heavy packer, Kipling’s Yubin range offers the more colorful selection of stylish and highly-functional pieces of lightweight luggages, assuring you of a happy hour in any airport lounge. clothing when going on a vacation, that’s why the Yubin 76 has adjustable packing straps for crease-free clothes. For short-duration trips, there’s cabin-size Yubin 55 which is the lightest trolley in the market right now that is acceptable in almost all airlines worldwide! 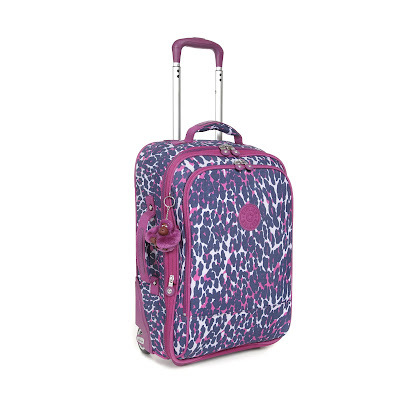 No need for cabin size and weight restrictions as this luggage allows you to travel light and in style. Its 33-liter capacity is ideal for those three-day or overnight sojourns, wherever your journey takes you. The Yubin 76 and Yubin 55 also have other features that make traveling convenient. These include an all-round zip for enhanced volume and open and zipped mesh compartments to cleverly organize your stuff! These luggages even makes you feel safe and secure with an integrated TSA-lock and soft-grip handles complemented with easy-rolling and lightweight EVA wheels. And of course, what could be more fun when travelling but with a furry Kipling monkey ring for that personal touch. In addition to the Yubin line are the Yubin Spin 55 and Yubin Spin 69 that has easy-rolling four wheels that that take you and your packed treasures wherever you go. Complemented with colorful plains and prints, travelling would never be as dull and boring as it was before. Available at SM Mall of Asia, SM North EDSA The Block, SM Megamall, SM Bacolod, SM Iloilo, SM Davao, SM Cebu, Robinsons Place Ermita, Rustan’s Alabang Town Center, Rustan’s Shangri-La, Rustan’s Gateway, Landmark Makati and TriNoma, visit Kipling Philippines on Facebook and get to find out more exciting news from the lovable monkey. ang gaganda ng color sarap mag travel with this bags!! I like both Yubin 55 and Yubin 76! 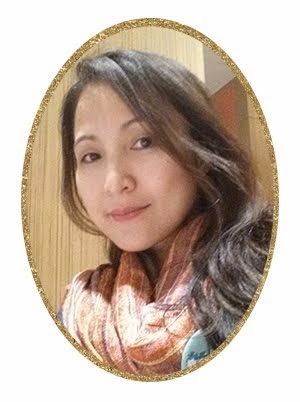 Kelan kaya magkaron nyan eh tamang kuripot ako sa pagdating sa shopping. Haha!